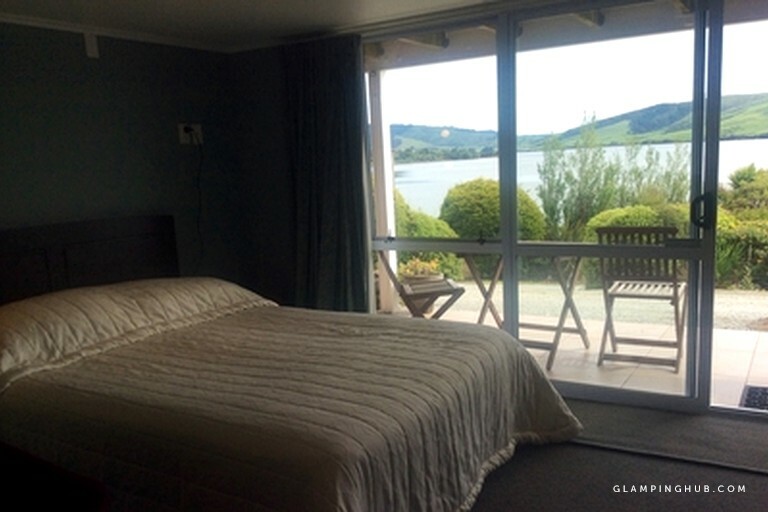 This romantic and secluded suite rental is located in Waikawa Bay on the South Island of New Zealand and is ideal for a relaxing beach getaway. The property can accommodate two guests. This studio-style suite features a large queen-size bed and a full bathroom. In the bright and modern bathroom, guests will find a toilet, a sink, and a walk-in shower. Freshly-laundered linens and towels are provided by the host. The light and spacious accommodation has a TV, with a selection of Freeview channels, for guests’ entertainment. The small, functional kitchenette comes with a fridge, a microwave, and a hot plate. There dishes and utensils for guests to create simple meals and snacks. Other amenities include an electric heater and an optional housekeeping service. Guests traveling by car will be pleased to know that there is free on-site parking at this property, for both cars and boats. All of the accommodations feature outdoor space, and patio furniture, along with electric heating inside, to ensure that glampers stay comfortable at all times. There is also a housekeeping service, when this is required. A child's crib is available upon request. This region is famous for its immense natural beauty, and its array of native wildlife. 10 minutes, by car, from the property, guests will arrive at Curio Bay, where there's a fascinating fossilized forest, which dates back to the Jurassic period, 160 million years ago. Visitors to the bay may also see protected yellow-eyed penguins, as they come ashore in the late afternoon. Papatowai, a 40-minute drive away from the property, is also a great place to get up close and personal with nature. Here, there are New Zealand sea lions, fur seals, penguins and many species of sea birds and fish, and the pristine waters are perfect for surfing and swimming. Guests who are able to should make the 50-mile trip to Kaka Point, where they'll have the opportunity to swim, surf, and kayak, on a surf-patrolled beach, for peace of mind. Those who like natural wonders should check out Cathedral Caves, 30 minutes away, where there are 100-foot high sea caves, accessible at low tide. Within 45 minutes of the property, is the astonishing Purakaunui Falls, where glampers can take an easy six-mile walk around this cascading three-tiered waterfall. Guests with access to bikes can enjoy the region’s bike trails, which are a fun way to explore this breathtaking area. There are rides suited to all different fitness levels. Keen fishermen will be pleased to know that there are many streams, rivers, and lakes in the Catlins, where it's possible to reel in freshwater brown trout. For those occasional rainy days, the Waikawa Colonial Museum and Information Centre is just a short stroll or car ride from the property. It features interesting stories and artifacts relating to the region's original settlers and their way of life. Within just five minutes of the property, is the award-winning Niagara Falls Cafe and art gallery, where visitors can enjoy delicious breakfasts and lunches, and a gourmet a la carte menu in the evening. There is no smoking allowed in the accommodation.